"...having reminded us of a very important message for the World, contained in God’s proclamation transmitted to the children of Fatima." 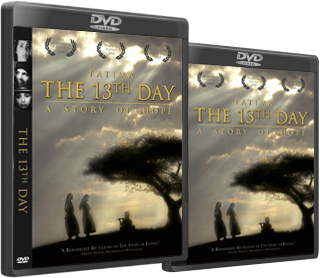 "A timely message of Fatima has been retold for a new generation"
"This is a triumph of a film"
"A remarkable re-telling of the Story of Fatima"
"The 13th Day is the best film ever made about Fatima"
You are now able to securely purchase The 13th Day directly from our website. Hit BUY DVD – and follow the simple online instructions. This is the MULTI-LANGUAGE subtitle version of The 13th Day, which is available in: Portuguese, Spanish, Italian, French, Polish, German, Czech and English. The DVD is priced at £16.99 + Postage and packaging. For bulk-buy or trade discounts, please CONTACT US directly for rates and information. DVD spoken in English, and subtitled in Portuguese / Spanish / Italian / French / Polish / German / Czech.